A cafe infused with Asian flavours – great place to be located. Different menu for brunch and dinner. So one visit is not enough! I’ve always hung around at Glen Waverley before I moved, it was the hang out place amongst friends catch up. White mojo plus opened not long ago and we’ve now tried their brunch, dinner and lattes. Busy but there’s usually enough space to get a seat without waiting. Service was just right. I ordered the chai latte. It was smooth and spice is a good amount – not super strong. J ordered their matcha latte. From other visits when I ordered their match lattes take away it’s not very strong in matcha flavour. 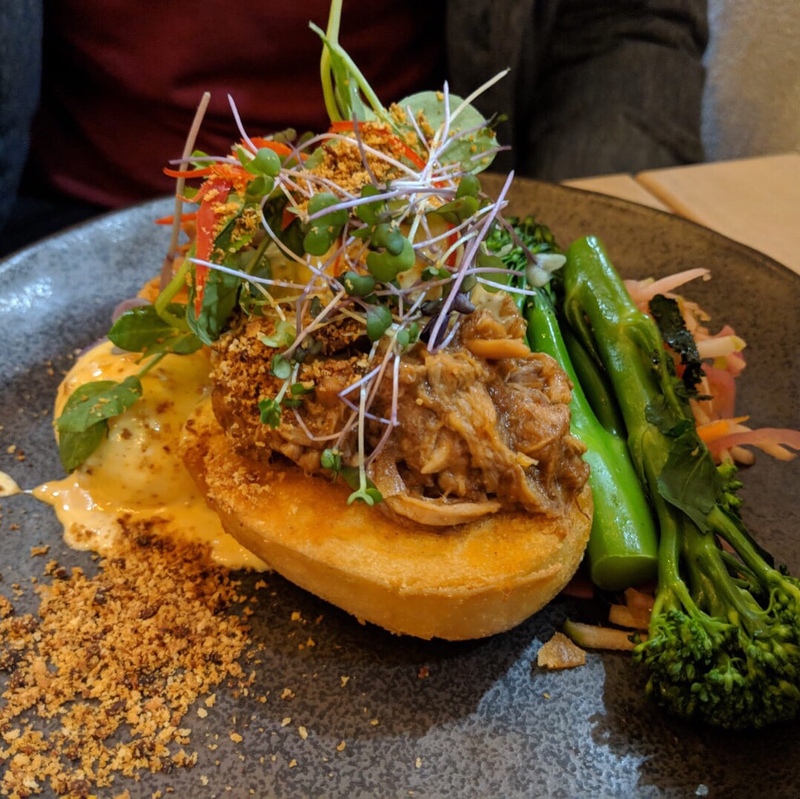 J ordered the Pork Benny – pulled pork shoulder apple and kohirabi slaw with brocollini chorizo crumb, xo hollandaise and poached eggs on fried bao. The broccolini was just blanched. White mojo plus made this pulled pork benedict an asian dish from their xo hollandaise. The xo hollandaise and chorizo crumb were amazing, The pulled pork was soft and not chewy like many other pulled pork meat you get from other brunch places. I loved the fried bao it made the crunch reminding me of asian bao – Yum. My favourite dish from this brunch visit. I ordered the wagyu sesame bagel (wagyu bresola & pastrami) with wasabi cream cheese, caramelised onion, fresh tomatoes and pickled served with pretzel. The bagel was huge when it arrived. Unfortunately, I wish the pretzel was chips or something home made. It’s a good idea being slightly healthier but I like paying for a side dish that is made by their kitchen. The good bits are the pickled and the toasted warm sesame bagel. It was the perfect bagel to bite through in the morning. Strong sesame taste with kicks of wasabi cream cheese to fill in the asian flavours. Every bite of the cream cheese would give the burger a good balance of cream and toasty-ness from the bagel but the sauce was a bit too strong. I can usually take wasabi, but not this much. Without the cream cheese the bagel feels dry. Maybe a drizzle of something else to mix it up? Overall, I’d like to dine there again, it’s not a 100% cafe, but there is a variety of dishes to choose from their menu and a convenient place to catch up with friends. Dessert, drinks and more.